One of the untold stories of the Holocaust—the nail-biting drama of Suzanne Spaak, who risked and gave her life to save hundreds of Jewish children from deportation from Nazi Paris to Auschwitz “vividly dramatizes the stakes of acting morally in a time of brutality” (The Wall Street Journal). 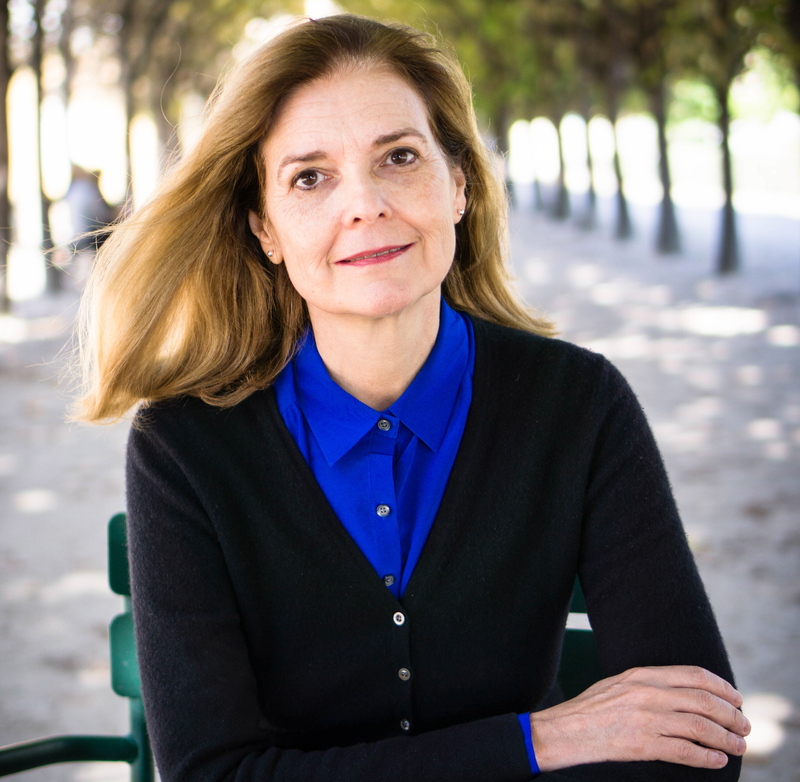 Suzanne Spaak was born into the Belgian Catholic elite and married into the country’s leading political family. Her brother-in-law was the Foreign Minister and her husband Claude was a playwright and patron of the painter Renée Magritte. In Paris in the late 1930s her friendship with a Polish Jewish refugee led her to her life’s purpose. When France fell and the Nazis occupied Paris, she joined the Resistance. She used her fortune and social status to enlist allies among wealthy Parisians and church groups. Then, under the eyes of the Gestapo, Suzanne and women from the Jewish and Christian resistance groups “kidnapped” hundreds of Jewish children to save them from the gas chambers. Suzanne’s Children is the “dogged…page-turning account” (Kirkus Reviews) of this incredible story of courage in the face of evil. 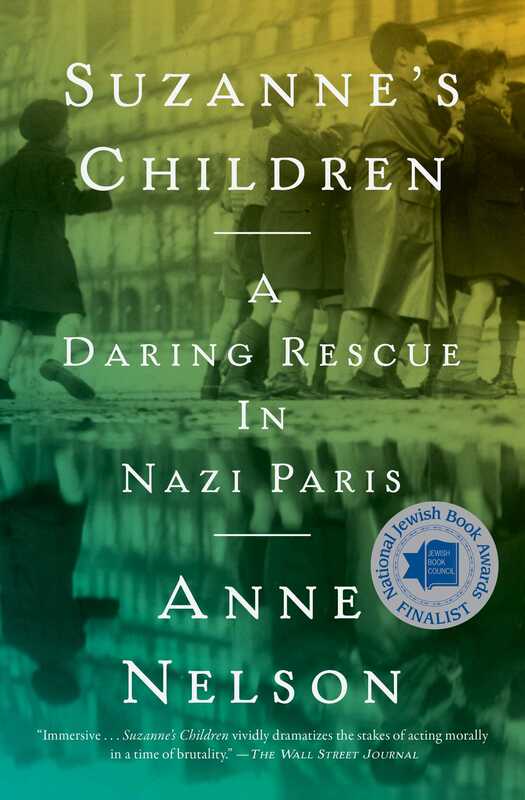 “Anne Nelson is superb at showing the upheavals in Europe since WWI through vivid, illuminating details…and she also masterfully describes the incremental changes in the Jews’ plight under the Occupation” (Booklist). It was during the final year of the Occupation when Suzanne was caught in the Gestapo dragnet that was pursuing a Soviet agent she had aided. She was executed shortly before the liberation of Paris. Suzanne Spaak is honored in Israel as one of the Righteous Among Nations. Nelson’s “heartfelt story is almost a model for how popular history should be written; it will satisfy lovers of history, Jewish history in particular” (Library Journal). Suzanne and Claude Spaak moved to Paris in 1937, bringing their two children, a surrealist art collection, and a large wicker trunk. They were a golden couple, attractive, affluent, cultured; the move was designed to mend the fault lines. Claude was frustrated in his writing career, and their marriage had faltered. Maybe Paris would help. Claude had outgrown Brussels, though the city had offered him every advantage. He owed many of them to his wife. “Suzette” was the oldest child of Louis Lorge, one of Belgium’s leading financiers. A self-made man, he spent his life pursuing wealth and social status. He had married into a prominent family and employed German and English governesses for his daughters. He provided his family with a mansion in Brussels, a house in the country, and holidays on the French Riviera. Louis doted on his firstborn, a petite blonde with long ringlets and a Cupid’s bow mouth. He decided that she should marry into the aristocracy and sent her to finishing school to study embroidery, piano, and household management. But she chafed at her father’s mercenary values and leaned toward literature and social reform. Louis Lorge strongly opposed Suzanne’s choice of husband, but she stood firm. A last-minute complication arose. The couple’s mothers discovered that there was a third party to the romance, a Canadian classmate of Suzanne’s named Ruth Peters. The two girls shared everything, including an infatuation with Claude. The mothers sent Ruth home to Toronto, and Louis took measures to protect his daughter’s fortune. Rather than disbursing her dowry in a lump sum, he would pay it in monthly installments to guarantee her a good living. When the brothers joined the family at weekly lunches, they never made it to dessert; one was certain to have stormed out. They taunted Claude’s young fiancée. When there was a lull, she stared at her plate until one demanded, “Suzette, do you hear the clock ticking?” and she would run to her room. As her father’s favorite, Suzanne expected to be treated with respect, but Claude chose to see her take his place at the bottom of the stack. The couple married in 1925. Within a year Suzanne was pregnant and miscarried, but the next year she gave birth to a healthy girl, Lucie. Claude sent the news to Ruth in Canada in an envelope bearing three horses, indicating her place in their relationship. The family nicknamed the child “Pilette” after a famous Belgian race car driver, whose garage sign caught her attention on her daily stroll. At home, all was far from well. Claude’s temper drove Suzanne to tears, and there were other complications. Claude was smitten with an older woman, whom he followed to the South of France. She humored him for two weeks, then sent him packing back to Brussels, whereupon he began an affair with a coworker. Divorce was legal but rare in Belgium, and Suzanne would be required to show cause, embarrassing the family. She wrote Ruth in Canada and asked her to come back. If Claude was going to have a mistress, it might as well be someone she liked. Ruth could calm Claude’s tantrums and intuit his wishes—and she could type. So she became his secretary, and Claude alternated between two beds. In 1931 Suzanne gave birth to Paul-Louis, or “Bazou.” On the way home from the hospital the taxi driver looked at him and exclaimed, “Quel petit gros bazouf!” (“What a big little fatso!”), and the nickname stuck. Claude and Ruth stood over his cradle and promised never to do anything that would hurt the children. By 1937 Claude decided that his career was stalled. Brussels was small, provincial, and dominated by his powerful family; his uncle was the current prime minister, and his brother Paul-Henri, the boy wonder of Belgian politics, was about to assume that position. In France, brother Charles had become one of the country’s leading screenwriters, and his coattails would be useful. Claude submitted some plays to Paris producers. Several expressed interest, and he packed up the family. It was, of course, Suzanne’s inheritance that made the move possible. Claude rented a comfortable apartment in the suburb of Saint-Cloud, and the couple installed the children, unpacked their trunks, and hung their Magrittes. Claude mingled with theater and film folk, but Suzanne felt out of place. Parisians were defying the Great Depression with madcap pursuits. Le Hot Club de France had just launched its first jazz label. Hemlines were long, waists were narrow, and the collaboration between surrealists and couturiers sizzled. Elsa Schiaparelli and Salvador Dalí designed a hat that looked like a shoe and a “skeleton dress” with a protruding rib cage. In July 1937 Suzanne’s father died, leaving her a sizable inheritance, and the couple bought a farmhouse in the bucolic village of Choisel, thirty miles south of Paris. They renovated it top to bottom and set aside a room for Ruth. Suzanne thought the country would be good for the children. Bazou was thrilled to be reunited with his German shepherd, Wotan, who had been left behind in Brussels, but Suzanne now found herself stranded in a hamlet of flinty French farmers and weekenders. Magritte, still struggling, wrote to patrons pleading for a stipend. When they turned him down, Suzanne offered him one thousand francs a month (roughly the salary of a secretary) in exchange for a series of paintings. The Spaaks amassed an extraordinary collection of forty-four works that would one day grace the world’s leading museums. In Spain, Fascist forces battled the democratically elected Republican government, and French newspapers warned there was worse to come. In April 1937 German and Italian planes bombed the town of Guernica, killing hundreds of civilians. Tens of thousands of refugees poured across the border into France. Suzanne helped those she could, including a girl named Carmen, who taught the children to dance the jota. Suzanne sewed Spanish costumes, and she and Claude took them to neighboring towns with the family gramophone. Locals gathered in the town square to watch them perform. Suzanne unfurled a banner—“Open the borders to Spain!”—as Bazou passed the hat. A photo shows Suzanne and her entourage raising their fists in a “No Pasarán!” salute. Monsieur von Rath [sic], third secretary of the German embassy [in Paris], was grievously wounded in his office. The aggressor is a young refugee of Polish origin who is not authorized to reside in France. Le Figaro concluded that the attack was a tragic consequence of France’s lax immigration policies. France’s ongoing excessive tolerance creates a battleground for those who are not interested in serving our country’s interests, only in undermining them. The teenaged Jewish gunman, Herschel Grynszpan, was a magnet for French anti-immigrant sentiment. He had acted in response to an immigration dispute between Poland and Germany that had left his elderly parents stranded in a refugee camp on the border. He walked into the German embassy and randomly chose his victim, who died three days later. On November 9 the Nazis unleashed Kristallnacht in Germany, burning synagogues, murdering dozens, and sending more than thirty thousand Jewish men to concentration camps. Some families ransomed their relatives and sent them abroad, driving another wave of Jewish refugees into France. A kind of madness seized the German population, and the hatred of the Israelite race today reached its paroxysm. The paper included a response from the Berliner Lokal-Anzeiger calling on the French government to expel the foreign troublemakers who “make their nest in Paris” and urging it “to begin with those who bear arms for Jewish Bolshevism.” France’s “excessive tolerance” toward Jewish refugees was now under internal attack. Suzanne had sympathized with the Jewish exiles in Brussels, among them Miriam Sokol. One day in 1938 she and her husband, Hersch, appeared on the Spaaks’ doorstep in France. The tiny, raven-haired Mira had met Suzanne through her women’s committee. Born in Vilnius, she had earned a PhD in social science in Brussels, where she met “Harry” Sokol, a young physician from a prosperous Jewish family in Bialystock. The Sokols, like many of France’s immigrant Jews, came from the tumultuous zone that spanned the Russian-German divide, where it was possible to live in three different countries over thirty years without moving house. They had been born in Czarist Russia, grew up under German occupation, and came of age in the newly reconstituted Poland. Each disruption brought more travails for the Jews. It was not uncommon for Jewish families to send their children as far away as possible, praying they would never come back. Mira found a job working for a Socialist member of the Belgian parliament, and Harry became a traveling medical supplies salesman who gave Marxist lectures on the side. This violated Belgium’s rules barring aliens from political activity, and they were expelled in 1938.6 They made their way to France with little more than Suzanne Spaak’s address. Suzanne was glad to see Mira. The two women shared interests and social concerns, as well as their outsider status. The salons of Paris had little to offer a shy Belgian housewife with a bookish turn of mind. Things were far worse for Mira, a penniless Jewish émigrée. Her husband’s medical degree and her doctorate meant nothing in France. When the Sokols arrived in France, Stalin’s purges were imprisoning and murdering tens of millions of Soviet citizens. Still, in Harry’s eyes Stalin could do no wrong. The Spaaks’ circle of friends included Communist Party members, but they considered Stalin and Hitler both to be monsters who had to be stopped. Suzanne was willing to help Communist refugees, but she had no interest in joining the party. Mira was Jewish? A litwak? A Communist? For Suzanne, these labels were of no interest. She could talk to Mira about family and literature. They discussed politics, but they were more concerned with humanitarian issues than ideology. For Suzanne, Mira’s Jewish identity was a subject of interest, not prejudice. Jews had lived in France since Roman times. The Revolution granted the country’s Jews full rights of citizenship, as it did France’s other persecuted minority, the Protestants. Most traditional French Jews had roots in the Alsace-Lorraine, the territory that straddled the French-German frontier. They began moving to Paris in the early nineteenth century, and soon gained entrée into elite schools, professions, and neighborhoods. Then came the crash of 1929. The appetite for immigrant labor vanished, but Jewish immigrants continued to arrive, spurred by the 1933 Nazi takeover of Germany. Between 1914 and 1939, the Jewish population of Paris doubled, and over 90,000 of the city’s 150,000 Jews were foreign-born. The newcomers were highly visible, expanding the Jewish quarter of the Marais and spilling over into Belleville and Montmartre. France was also straining to cope with refugees from Spain. The Spanish Republican government collapsed in March 1939, and Fascist forces took control of the entire country. Refugees crossed the Pyrenees into France until their numbers approached half a million. The French government’s response was wretchedly inadequate. Some ten thousand Spanish refugees perished of cold, hunger, and disease. The Spaaks completed their handsome renovation of the house in Choisel, and it stood blanketed in blossoms and tranquility. But history was intruding, as Europe headed for war. In the summer of 1939 Suzanne suffered what her daughter later described as a breakdown. As the children played with the dog in the garden, Suzanne watched immobile from the chaise. Why did their mother look so sad? the children wondered. Something had gone terribly wrong. Suzanne, who didn’t drive, was trapped in Choisel. At thirty-five, she had no control over her life. Claude was pulling further and further away. Her marriage was a failure, but she couldn’t bring herself to leave him while the children were young. She was cut off from her friends and family in Brussels, as well as the activist circles that gave her purpose. She feared an impending war that threatened to destroy everything she loved. On August 23, 1939, Germany and the Soviet Union announced a mutual nonaggression pact. In political terms, this was impossible to grasp: the Nazis and the Bolsheviks were blood enemies. It made sense only in that both countries wanted something, and they needed to cooperate in order to get it. What they wanted was Poland, a country glued back together from the fragments of Russian- and German-speaking empires twenty years earlier. Stalin and Hitler denied Poland’s right to exist. Germany claimed the port city of Gdansk, formerly Danzig, and the western territories that had previously been East Prussia and expanses of the Austro-Hungarian Empire. The Soviets coveted western Ukraine and the Baltic regions. Since 1918, Poland’s government had been run by a series of generals and dictators. Anti-Semitism was rife, and the political system was corrupt. Nonetheless, France and England had signed mutual defense treaties with Poland. For three years they had stood by as Hitler grabbed the Rhineland, Austria, and Czechoslovakia in violation of international law, but Poland was where they drew the line. The French Communist Party, subservient to Moscow, was trapped in contradiction. Many of its members were Jews and Communists who had fled the Nazis. Now they were expected to support their persecutors as allies against the “Western Imperialists” in Britain and France. As the war approached, Ruth Peters returned to Europe and joined the Spaaks in Choisel. France was in disarray. Léon Blum, the Socialist Party leader, begged the French Communist Party to renounce its allegiance to Moscow. When it refused, the French government dissolved the party, and it went underground. Mira and Harry Sokol’s situation was more precarious than ever. They risked arrest or deportation as undocumented immigrants, and the Soviet Union was the only imaginable avenue for escape. The Sokols might have paused had they known more. Stalin’s purges had decimated his army officer corps and the intelligence service, and he had extended his accusations to the international Communist movement. Within a few years he slaughtered hundreds of members within his reach, including most of the Central Committee of the Polish Communist Party (many of them Jewish). Following the pact with Hitler, he ordered his agents to round up six hundred German Communists who had sought refuge in the Soviet Union (many of them Jewish) and deliver them to the Gestapo. The Sokols’ failure to emigrate may have prolonged their lives, but their prospects were dim. They were stranded in France, jobless, homeless, stateless, and friendless—except for Suzanne and Claude Spaak. I. The painting was acquired by the Tate Collection in London. II. Nazi propaganda minister Joseph Goebbels also banned it in Germany, while in the US, Eleanor Roosevelt screened it at the White House. Anne Nelson is an award-winning author and playwright. She is the author of Suzanne's Children; Red Orchestra: The Story of the Berlin Underground and the Circle of Friends Who Resisted Hitler; Murder Under Two Flags: The US, Puerto Rico, and the Cerro Maravilla Cover-up; and The Guys: A Play. Her work has appeared in The New York Times, Los Angeles Times, Harper’s, BBC, CBC, NPR, and PBS. Nelson is a graduate of Yale University and a member of the Council on Foreign Relations. She teaches at the Columbia School of International and Public Affairs in New York City.